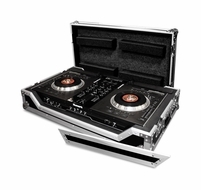 This ATA style Coffin case is specially designed for the Numark NS7 Serato ITCH performance controller. The RRNS7W features low profile wheels for carefree transportation, beefy ball corners, recessed handles positioned for both briefcase-style carry and rolling transportation, room for laptop stand/accessories, and front and rear access panels. Transporting your NS7 has never been easier!